The power of Mullan’s book lies in his meticulous research, which is of the quality you’d expect from the author of Eyewitness Bloody Sunday… de Róiste’s case would appear to underline something we already know: that the defence of freedom and justice requires eternal vigilance. We’re lucky to have people as vigilant as Don Mullan. 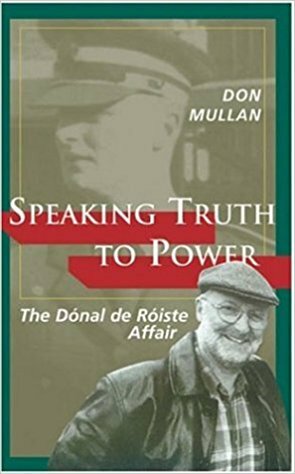 Speaking Truth to Power: The Donal De Roise Affair (Curragh Books, Ireland, 2006) is Don Mullan’s third major investigative book. Mullan was first contacted by De Roiste while he was campaigning and researching The Dublin and Monaghan Bombings book. He was a friend of De Roiste’s sister, Adi Roche, whose unsuccessful campaign for President of Ireland he had supported in 1997. It was during that campaign he first learned of Donal De Roiste’s ‘retirement’ from the Irish Army in 1969, as it was used to undermine and damage his sisters presidential bid. De Roiste sent Mullan a number of letters and enclosed supporting documents in the hope of encouraging Mullan to take up his case. Mullan was initially reluctant as he was dealing with a number of projects in development, including Dublin and Monaghan campaign and the Bloody Sunday movie. However, one day in 2002, while searching his filing cabinet, he pulled the file on De Roiste he had opened and began to read its contents. He was perturbed and immediately called De Roiste and informed him he was willing to support his campaign. Over a four year period, Mullan researched the puzzling case, trying to understand why De Roiste had been ‘retired’ by the Irish President. Over that period he invested a full year and a half of his time. His only funding was a £20,000 stg grant from the Joseph Rowntree Charitable Trust. Mullan could not find a plausible reason to justify the determined speed with which Irish Army top brass moved to have De Roiste ‘retired’. The speed instinctively made him suspicious, especially when he discovered the young Irish Lieutenant had been denied his Constitutional rights to face his accusers and challenge their accusations, through the use of a loophole in the Irish Defence Act. After more than a year of following leads that took him to dead-ends or cul-de-sacs he recalled a conversation with a Commandant Patrick Walsh, an officer in De Roiste’s graduating class, who retired after a distinguished career which included serving as a UN Peacekeeper. Walshe remained supportive of DeRoiste throughout his career, believing he had suffered a grave injustice. Commandant Walshe told Mullan he recalled a phone call from De Roiste as a young officer, in 1968. He said De Roiste was distressed because senior officers were pressurising him to lie about a vehicle collision in Tipperary, involving a young female teacher who had been seriously injured. De Roiste was one of three passengers in a vehicle driven by a senior officer whom De Roiste claimed was drunk when his vehicle collided with the young teacher. Mullan eventually tracked down the young teacher who gave him the legal documents related to the car accident. Upon careful examination Mullan discovered that just two weeks before De Roiste’s difficulties began in the Army, lawyers representing the young women issued a plenary summons against the senior officer. The proximity of the summons and De Roiste’s expulsion seemed suspect. Mullan proposed the hypothesis that the rush to expel De Roiste under a cloud of suspicion, invoking a Defence Act loophole, was directly related to the summons served upon the senior officer, Commandant Sean T O’Kelly. The stakes were now raised with the case heading to the High Court. Irish Army top brass knew that De Roiste had already refused to lie internally and, most likely, would not do so under oath. Consequently, O’Kelly, a senior Transport Officer, was facing the probable termination of his career, having already perjured himself in relation to the serious injuries sustained by a civilian due to his intoxication. On 29 June 2002 the Irish Times ran a two-page article by Don Mullan which rocked the military establishment. On the day of publication Mullan received a phone call from a relative of Commandant O’Kelly who suggested Mullan’s hypothesis had validity due to a meeting and conversations he had been privy to. 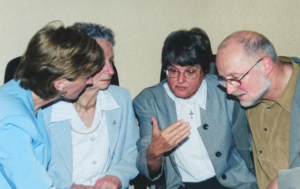 Sr. Helen Prejean, author of ‘Dead Man Walking’, who was portrayed in an Oscar winning performance by Susan Sarandon, was in Ireland at the time of publication, and was staying with Mullan and his family. She agreed to attend a press conference to voice her support of De Roiste and his call for the restoration of his good name. Mullan also secured the support of Irish actor, Gabriel Byrne, who helped launch a USA campaign at the New York Irish Arts Centre. The controversy created by Mullan’s Irish Times article lead to the then Minister for Defence, Michael Smith, ordering an internal investigation by the Judge Advocate General, Una McCrann SC, on 1 July 2002. McCrann’s report was deeply flawed and was eventually quashed by the High Court after De Roiste’s lawyers challenged its fairness.